Becky Bedbug: How are you voting? After asking around on Twitter, I managed to find bloggers voting for five of the larger parties: Conservative, Labour, Liberal Democrats, Scottish Green and Scottish National Party. As with last time, try as I might, I couldn't find anyone voting UKIP or other smaller/regional parties. To avoid any bias, I've popped the parties in alphabetical order and I've not included my own views in this one as I want to keep it as balanced as possible. With all that said, let's see what our bloggers have to say. 'My vote is based upon both the policies Labour have laid out and what I feel other parties are lacking. I’m voting not only for myself but in mind of younger people who are not of voting age and how I felt at 16 during the 2010 election. Firstly, Labour are proposing to banish zero hour contracts and boost the incomes of the poorest. Luckily I’ve never been on a 0-hour contract but know people who have, and their lives have been shaken up due to last minute demands for shifts and never knowing when they can plan social events due to work commitments taking place, especially on minimum wage. They also plan to close the gender pay gap! Judging by news reports, and the experiences of people I know, a lot of folk are registering to vote for the first time, regardless of how old they are. The UK election system can be pretty confusing, and Voting Counts are working to help with this. 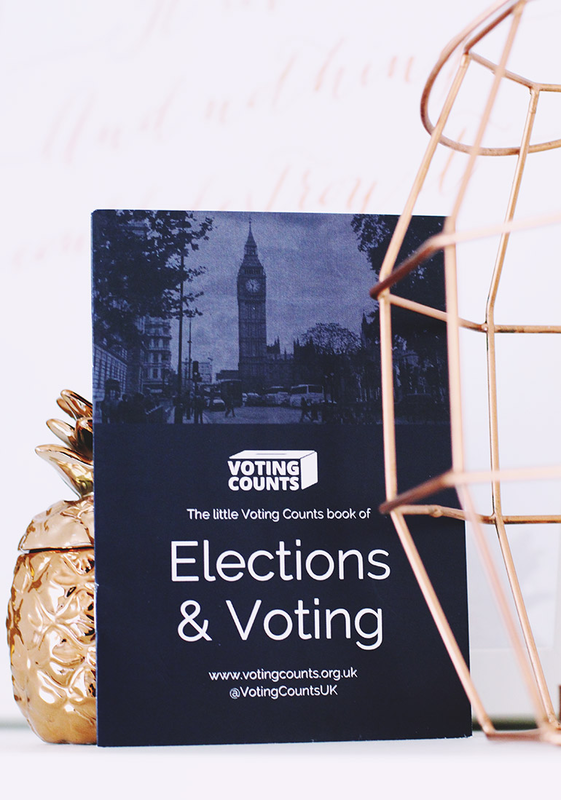 A small organisation, Voting Counts is an unbiased political resource, explaining the importance and relevance of British politics without being affiliated to any particular parties. This means the information they offer is completely impartial, allowing users to access help and advice that they can apply to their own experience. Voting Counts explains the likes of our First Past the Post voting system, how to find your local polling station, and why it's important to vote. The handy little booklet in the top image of this post has been produced by them and holds a wealth of information including a glossary. It's well worth checking it out and passing on the link to anybody you know who may be feeling a little confused. As you can see from this post, there are a whole load of reasons as to why you might vote a particular way but the only person who can ultimately make that decision is you. If you're happy sharing, I'd love to hear who you're voting for and why in the comments. I love that you do posts like this, elections are never a time to be apathetic and I feel like not enough bloggers use their platforms to raise awareness. I'm a stanch supporter of Labour, ever more so since Jeremy Corbyn became leader. I have a severe mental illness, so the protection of the NHS is a huge part of my voting as it's literally a case of life or death for me. Labour also offer better protection for disabled rights and other minorities. I just in general feel that Labour are more for the people, whereas Conservatives are more for themselves. Also in these times we live in with the threat of war I'd feel much safer with Labour in office as Conservatives are a little too enthusiastic over the prospect of pressing the nuclear button which is terrifying. I'm labour all the way - my greatgrandad was the labour MP for my area all through the war and so we were always brought up putting labour leaflets through doors and wearing rossettes. The older I've gotten the more I find myself supporting their policies as they tend to be the most in line with what I believe and support. Either way labour is practically a part of me and I doubt I'll ever change. I'm glad you do posts like this, too. I missed the last one, glad I saw this one! I'm very much in the liberal camp and also in the 'vote for whoever has more of a chance to block the tories' so, if I were to vote (I can't, not British; don't come at me! I ALWAYS vote in Spanish elections) it'd be Labour, even though I sort of sympathize a fair bit with the SNP as well. I can't say I share your excitement re elections, though I'm glad this one is short! (And I'm glad I'm so incompetent I usually forget my own elections are coming up until the day of, upon which I cram on policies and names before heading to the booth.) I'm still feeling election fatigue from the US primaries, I kid you not. I voted Tory at the first election I was able to (2010) and I have been nothing but ashamed & disgusted by my choice ever since. I'm not a Labour voter, I'd say my morals align better with the Greens, but I'm voting Labour this election because, in my opinion, stopping the Tories dismantling public services, leaving disabled people to starve, and generally not giving two-hoots about the majority of the population & the struggles they are facing, is more important than voting for the party I agree with most right now. *refrains from continuing enraged ramble* very strong feelings here!